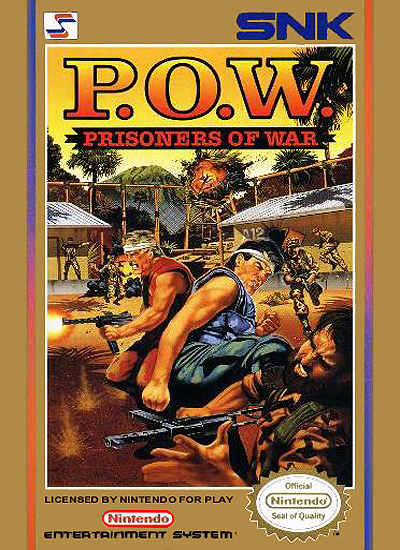 SNK has been releasing old school arcade games to the PSN, the latest being P.O.W. – Prisoner of War. But is the $2.99 price tag worth the trip down memory lane? Personally, my experience with P.O.W. has solely been with the NES version but was surprised as to how similarly the arcade version played to its console brethren. This arcade beat’em up was designed to take your quarters but luckily the player can enter a virtual token via the triangle button at any time. Needless to say, the game’s difficulty is quite tough, sometimes getting killed just as fast as you spawned. Similar to any other beat’em like Final Fight or Streets of Rage, the goal is the kick the snot out of everybody that stands in your way while you make your way to the right of the screen. Unlike these two other classics, P.O.W. is different because the goal is to escape to freedom as opposed to clean up crime. This makes using that knife and rifle a little more justified in term of plotline. However, it is a wonder as to how the playable prisoner managed to create a bomb while locked up in his cell from the opening cinematic. But then again, things were simpler in the 80’s. It will take approximately 20-30 minutes to kick, punch, and jump your way through to the end credits. Unfortunately, the game is a lesson in repetition as your nameless hero fights faceless pallet swapped enemies. Instead of boss battles, the game will often pit you against throngs of enemies that will easily overwhelm and force you to hit that virtual quarter deposit button almost as often as the attack button. And although the graphics are definitely more detailed than the NES version, it isn’t exactly the best looking classic SNK arcade game – the climbing-up-the-ladder animation is especially charming. One of the best features of these SNK Mini titles is the ability to play on both the PS3 and the PSP. You can even play multiplayer on the PSP via ad-hoc as well. But even though there is no online co-op or leaderboard features, they are not really needed as one walk down memory lane will be all that is needed to re-live this gaming classic. I wouldn’t say that P.O.W. is necessarily a bad game, but it doesn’t hold up as well as I would have liked and for a couple bucks more you can download other classic beat’em ups like Streets of Rage II or Golden Ax from the PSN that have online capabilities and Trophies.